To learn more about this amazing Derby hat that is up for bid from November 1st through the 11th please click on the "Silver Charm" hat above. Bidding on the “Silver Charm” chapeau had ended. 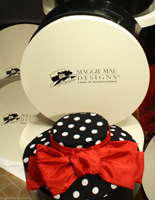 The next hat will be up for bid from December 1st through the 11th. Special Honors: Champion Three Year Old Male, 1997; inducted into the Thoroughbred Racing Hall of Fame, 2007. Silver Charm entered stud in 2000 at Three Chimneys in Kentucky; relocated in 2005 to Japan and stood at Japan Bloodhorse Breeders Association’s Stallion Stations until 2014. Retired to Old Friends on 12/1/14 through the cooperative efforts of JBBA, the Lewis family and Three Chimneys. 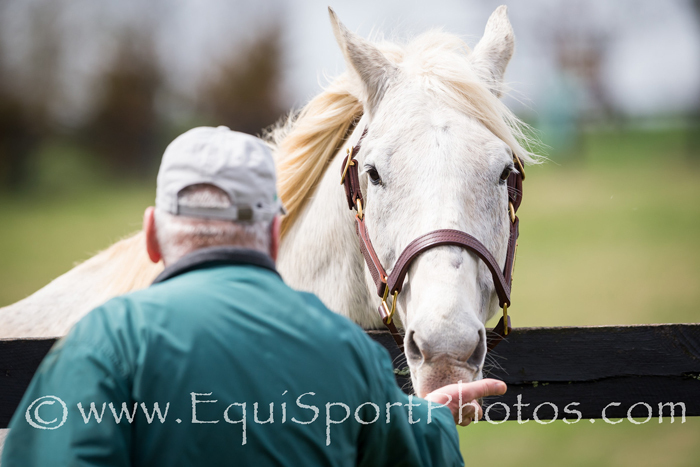 "Silver Charm Arrives at Old Friends" - a video by Wendy Wooley of EquiSport Photos that documents Silver Charm's arrival at Old Friends on December 1, 2014. 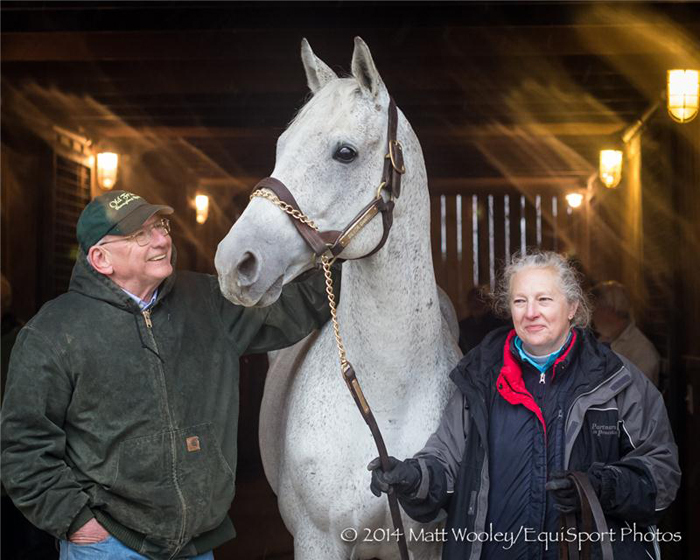 Interview with Michael Blowen, December 2, 2014, following Silver Charm's arrival at Old Friends. 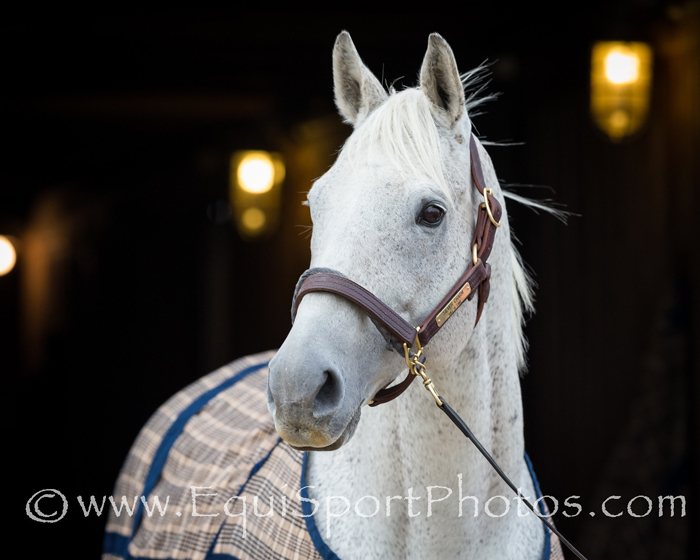 Silver Charm, on the day of his arrival to Old Friends. 1997 Kentucky Derby and Preakness winner Silver Charm was bred in Florida by Mary Lou Wootton. Owned by Robert and Beverley Lewis and trained by Bob Baffert, he leaped to a juvenile stakes win in the 1996 Del Mar Futurity (G2) ridden by David Flores, then hit the 1997 Derby trail with his San Vicente (G3) win, Chris McCarron up. The Kentucky Derby began Silver Charm’s partnership with jockey Gary Stevens. In a thrilling finish they prevailed over Captain Bodgit and Free House. A repeat performance in the Preakness raised Triple Crown hopes and Silver Charm ran a heroic Belmont, but he was edged out by Touch Gold. Silver Charm was awarded the 1997 Three Year Old Male Championship. In 1998, teamed with Stevens, he won the San Fernando (G2), Strub (G2) and prestigious Dubai World Cup (G1), Kentucky Cup Classic (3) and Goodwood (G2). A close second in the 1998 Breeders’ Cup Classic and win in the Clark (G2) rounded out this superlative campaign. At five, Silver Charm won the San Pasqual (G2). In his 24 starts he achieved 12 wins, 7 seconds and 2 thirds for $6,944,369. He entered stud in 2000 at Three Chimneys in Kentucky, was relocated in 2005 to Japan and stood at JBBA’s Stallion Stations until 2014. Silver Charm was inducted into the Racing Hall of Fame in 2007. In December 2014 he retired to Old Friends thanks to the cooperative efforts of JBBA, the Lewis family and Three Chimneys. We hope that thoroughbred racing fans from around the world will enjoy visiting Old Friends and saying 'Hello' to one of America's great race horses!" Bidding on the “Silver Charm” chapeau has ended. The next hat will be up for bid from December 1st through the 11th. 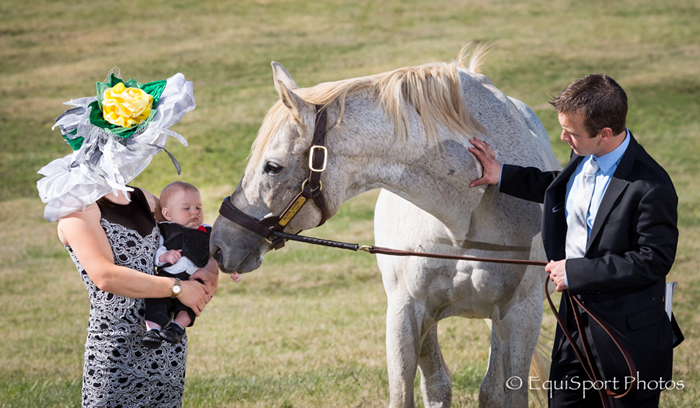 Special thanks to retired jockey Rosie Napravnik, to her husband, trainer Joe Sharp and to their baby boy Carson for helping us with this year's “Hats Off to the Horses” fundraiser that supports the retired racehorses of Old Friends in Kentucky. Thanks also to EquiSport Photos for their stunning images and video footage. A special thanks to Bella Rose Clothing Boutique of Lexington, Kentucky for furnishing Rosie's lovely dress! The “Silver Charm” hat is up for bid from November 1st through the 11th. 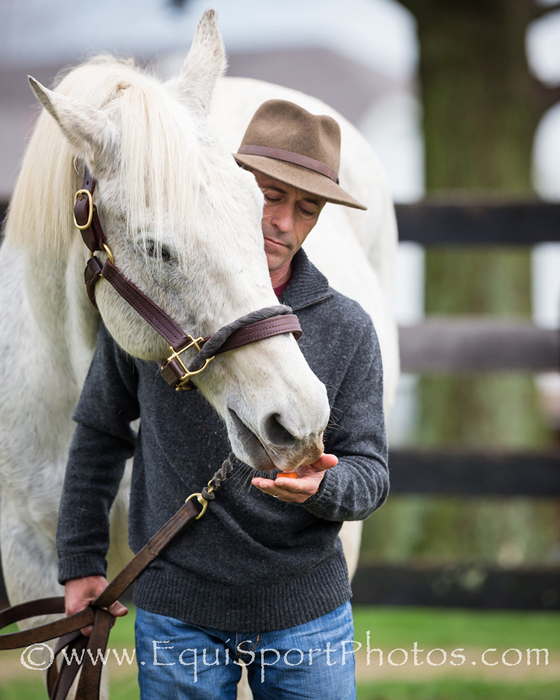 To place a bid on the “Silver Charm” auction hat or to learn more about Old Friends at Dream Chase Farm, please visit the Old Friends website to access the eBay link or call them at 502-863-1775. 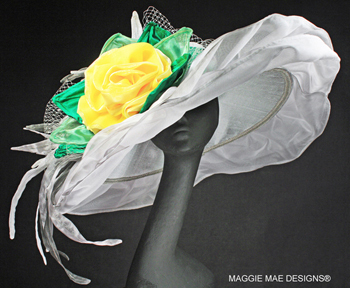 A very special hat ongoing collaboration with retired jockey Rosie Napravnik to benefit Old Friends! 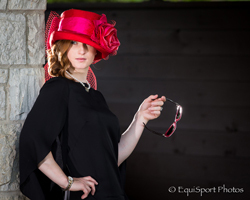 Perfect for horse racing events, polo matches, steeplechase and carriage driving events!